The next stop was to see the Belted Galloways (Or Belties, as they are known). This breed of cattle originated in Scotland and are a very hearty breed of beef cattle. 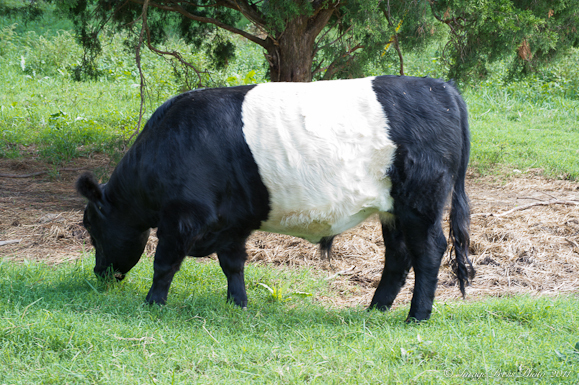 Chef Bedford told us that the only job the Belties have at Fearrington is to stand around and look good, so it doesn’t take much heartiness to do that other than trying to stay cool in the hot summers of North Carolina. The Culinary Retreat package included afternoon tea and an enjoyable wine and hor d’oeuvres reception in the Garden House with Chef Bedford and the other class participants. The reception was then followed by a dinner with wine pairings with our group. Our meal was exceptional. Everything was beautifully plated and each bite of the dishes offered a unique burst of flavor. It was then that I became really excited about the next day’s class. I could not wait to learn from and work with this incredibly talented chef in his kitchen. I will be sharing the details of our Culinary Class at Fearrington House Inn with you next along with a recipe from one of the dishes we prepared. In addition, I will have an interview with Executive Chef Colin Bedford next week. 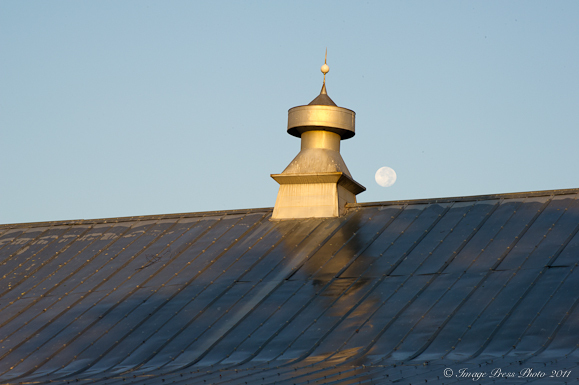 * Disclosure – I attended the Culinary Retreat as a guest of The Fearrington House Inn. I have not been paid to write any of these posts. The opinions I express regarding the property and the class are my own. I have been to Fearrington Inn a couple of times and I’m excited to get to share the little piece of Heaven with my husband in the coming year. My mom was kind enough to give us a gift certificate for the Inn. I cannot wait and seeing your pictures just reminds me of the tranquility of the place. I’m going to have to look into the cooking retreats. It’d be great if we could plan our trip around one of those! Thanks for your great post and I look forward to part 2. I hope you have a wonderful time at Fearrington House Inn. It is a very peaceful place and a wonderful spot to take a breather and just relax. Hopefully, you can attend one of the culinary classes while you are there. There is one more this year. What a fun getaway! I think North Carolina is the prettiest part of the country. I’m adding this to my foodie travel to-do list! Very very cool! The place is gorgeous – love the inn (especially that bathroom) and the chef jackets are so great! The trip sounded like it was not only a great success but wonderful fun as well. Lucky attendees! So thrilled for you that it went so well! And are those goats or large Boston Terriers? I want to attend one of your cooking adventures!! I wish I had known you were visiting! I live just down the road from Fearrington, and have been enjoying reading your blog for the past year. Hope you visit again! Thank you for reading Bunkycooks. 🙂 I am sure we will return at some point. We had such a wonderful time. I will be sure to send you an email next time we head your way. We drive past Belted Galloways on our way into Franklin. 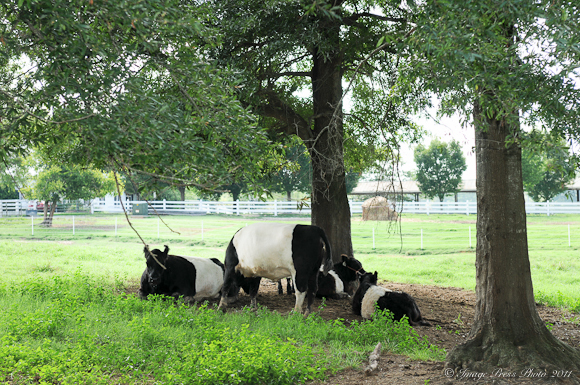 Oreo cows! Love seeing them: Double Stuff indeed! I feel like I was right there with you; love how you spool out the story with words and images. Next time you are up in North Carolina, I will look forward to a visit. I’ve been to Fearrington House for events, and wondered what an insider’s view would be. I can’t WAIT to get into the kitchen, peeking over y’all’s shoulders that is. Thank you for your comment. 🙂 We will definitely head your way at some point! As you know, we are in NC quite a bit. Fearrington is a lovely property and it was so much fun to work with Chef Bedford in their kitchen. Such a great post. North carolina seems like a great place to go for a retreat from the noisy city. I bet you enjoyed yourself. Great photos. Yes, NC is definitely a great place to escape to. Atlanta can be a bit overwhelming some days. It’s nice to sit back and enjoy the quiet while visiting places like Fearrington House Inn. Sounds like fun, but WAY too expensive for me. Would be nice if they offered the classes without needing to make reservations at the Inn. We are traveling down that way next year and staying at a local Pittsboro, NC B&B while my husband attends a Roy Underhill Woodworking class. The price of the cooking class may seem a bit high, but it includes your overnight stay, tea in the afternoon, a cocktail party with Chef Bedford and dinner the evening before the class (with wine). The rate also includes breakfast, the full-day class, and the lunch with wine that is prepared during the class. You could certainly contact Fearrington and see if they could price the class out separately. I do think you might miss out on the full experience doing it that way, but maybe it is a possibility. Working with a professionally trained chef (and one that is now a Grand Chef) is an incredible opportunity, if you ever have the chance to do it.